What adjectives come to mind (what adjectives do you immediately think of) when you hear the word “cool” used to describe someone? Researchers recently asked a similar question to almost 1,000 people between the ages of 15 and 56. According to a story in the Los Angeles Times newspaper, the research was prompted (make someone decide to do something) by a disagreement among friends. One of them was trying to decide if a certain American actor and director was cool. But the friends couldn’t agree about what makes a person cool, so they designed a research study to find out what people think about when they hear the word “cool” used to describe other people. The New Oxford American Dictionary tells us that using cool to say that people or things were fashionable or impressive began in the 1920s. It was first used by African Americans and became popular, together with jazz, in the 1940s. In the 1950s and ’60s it was popular among beatniks – a group of young people who were non-conformists (didn’t think or act like most people). When people use cool to describe other people, the research study discovered that they use it in two very different ways. The first kind of cool person is someone who appears to be confident and successful. They’re attractive (enjoyable to be with), likable, and make people around them feel comfortable. The second kind of cool person is quite different. 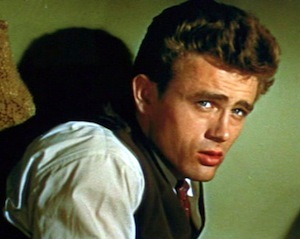 We would use it to describe James Dean, an American actor who was killed in an automobile accident when he was 24 years old (see his picture above). For many people, Dean represents teenagers of the 1950s who had become disillusioned – disappointed with life because it was less good than they hoped it would be. He played such a teenager in his famous film, Rebel Without a Cause (a rebel is someone who refuses to do something in the way people want them to.). People who are cool in a rebellious way appear confident, but they don’t usually show their feelings. They often act detached (not connected with other people) and aloof (not friendly). This idea of cool also appears among jazz musicians. In the LA Times article, the director of jazz studies at New York University says that “[jazz] musicians still want to act cool and act separate, to follow their own path rather than [the path of culture]” and to be individualistic (do things their own way and not worry about other people’s opinions). Miles Davis, a famous jazz trumpet player, is often described as cool in this way. What adjectives come to mind when you hear the word “cool” – to describe people or anything else? ~ Warren Ediger – English tutor/coach and creator of Successful English, where you can find clear explanations and practical suggestions for better English. Photo of James Dean courtesy of Wikipedia Commons. thanks Warren for giving out the origin of this world that I hear so frequently. I would agree with the result of the research. My personal idea of someone cool is likable attractive. What astrange term aloof is. It also sounds funny. I remember it because I was once reading about Mr Obama as being someone aloof. Strange word indeed. Cool used in other situations makes me think of something impressive, exciting, unexpected, and surprising. A situation where one does not know what to say so he she goes COOL!! Just to give an example I would describe COOL the new episode of a videogame called GTA V coming out next spring. In short is the story of Jeff. Some guys that move to California and there you go start the adventure. Can’t wait to play that. Of course ESLPOD is COOOL!! I often get the words WORD and WORLD mixed up. Not my fault they sound the same. It is just a micro error. Man , the question is totally subjective. The answer changes depending in the contex. When you say cool alone , the first thing pops in my mind is :Don’t worry about it ,you are fine with it. When you say it is cool. My first impression is : hip , sick , whack or sth. when I hear the word”cool”,adjectives such as crazy,unique,brave…..came to my mind, and I think James Dean is cool. I have nothing to do really, so I thought why not writing something down? I would like to share with you this, at least for me new term, I came across this morning reading an article. The phrase was ” .All three women, however, have shown a knack for productive socializing. The word I did not know the meaning was KNACK. That is: an aquired or natural skill at performing a task. My hope is that writing it down here I will be able to remember it. Ops! I have just find out that they explained knack on episode 387 ESLpod. YES! YES! I am so exited! I have seen Lucy! Do you wanna know where? Look the third anniversary video at 9:05 you can see her beautiful right eye when she looks at Jeff. I was watching it to see if I could spot her mirrored in Jeff’s eyeglasses. By the way guys that was a very funny video of yours. I like Jeff’s faces while Lucy is talking. Thank you very much indeed , Warren, for this ‘cool’ article. It is the coolest way to study a word that so many of us take for granted. I went to the LA times article in order to find out more about the research on ‘cool’. Never imagined some social scientists would take a seemingly simple word so serious. ‘Cool’ = ‘nice’ when my son says it. ‘Cool’ = ‘special’, ‘admirable’ when my sister says it. ‘Cool’ = ‘keep calm’ when I say it. I guess Peter is absolutely right when he says “the question is totally subjective. The answer changes depending on the context”. Might be from now on I will pay more attention to what people actually mean when they say ‘Cool’. We English learners must be the coolest species on earth. A big ‘Thanks’ again to Warren our ‘coolest’ English teacher. I knew Dan was special when I read his questions. Dan you have the curiosity mind of a coming-of-age genius. I also love to have a glimpse of our cool teacher Lucy. I did what you did, try to see if I could find Lucy from Jeff’s glasses. It took me a lot of trials before I finally got a clearer picture of Lucy. Yes, she has got beautiful right eye. Sorry Lucy I can only say right eye because I only saw your right eye, not because my English is so poor that I did not know you had two eyes. Kudos to you, Dan, you are great. I just had nothing to do. See! see! sometimes having nothing to do brings something good. If I had been busy, I would not have been able to see the beautiful right eye of Lucy. I am not sure about this last sentece. The conditional is not easy to remember. From Dan: “If I had been busy, I would not have been able to see the beautiful right eye of Lucy”. Hi Dan, I read the above sentence many times to see if I “feel” it wrong. I can’t say it is wrong. So, it must be right. However, as a learner of English as a second language, I am not 100% sure about it. I think we need Jeff, Lucy and Warren to tell us whether it is right. patient and study everything and do every exercise in order to do well in the Assessment. But, Grammar is unbearable at times. I want to take a leaf out of your book, Dan I am going to start studying for English Grammar really properly. Well done, cool article, comrade! So exciting to curl up with a cup of hot tea reading some interesting and informative stuff like that in the evening when the day is coming to an end and my body wants to rest. Cool, cool, cool, thank you very much, all of you, honor to be your follower and reader. Wish everyone a lucky week, cool events and a vast peaceful meadow to take a nap. have you ever come across this problem? and how did you reinforce your memory to words?? hope you could help me out! !